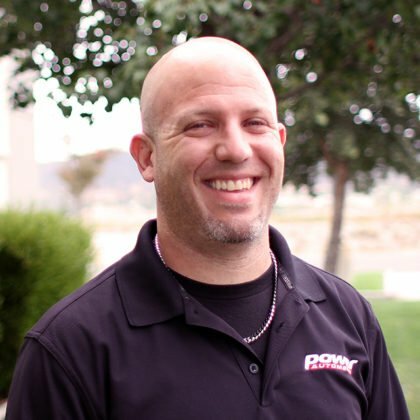 In this installment of Ask The Experts, we’ve submitted a wide-ranging list of your questions to Ben Strader of EFI University. Strader offers an extensive resume, with experience in electronic fuel injection calibration, motorsports wiring and configuration, along with engine machining and assembly. EFI University has taught nearly 10,000 students over the last 15 years, and Strader’s expertise is routinely sought out by the world’s top motorsports manufacturers. Here are the top questions selected by EngineLabs for Ben’s consideration, along with his detailed answers. Enjoy! 1) Is there such a thing as too much resolution in a fuel or spark table? Will I really benefit from an ECU with 24 x 24 tables, vs one with 12 x 12, or 16 x 16? Ben Strader: Hi Casey, that is a great question. Most ECUs have a flexible amount of rows or columns that can be user-selectable, so that the size of the table can be adjusted to the needs of the engine’s torque curve. The ones that don’t allow user selection of the number of sites typically do allow at least the ability to set the breakpoints for the same reason. The reason behind the need for this flexibility, is that various types of engines have different torque curve shapes. The shape of the torque curve is determined by the actual engine airflow, and the job of the tables is to supply the correct amount of fuel and ignition at each point the engine operates, based on the airflow at that point. So, the amount of resolution any given table needs is a function of the shape of the torque curve. For example, if you had an engine with a very flat torque curve, then essentially the amount of fuel required at each rpm point would be very similar or even the same as the one next to it, so having RPM breakpoints every 100 RPM would only result in a table that has a bunch of redundant numbers in it. Let’s say an engine makes 400 lb-ft at 3,500 rpm and 420 lb-ft at 4,000 rpm. We would assume that at 3,750 rpm, it likely makes somewhere in the neighborhood of 410 lb-ft, so we might draw a straight line for the fuel table values between those two points. Now, when we run the engine, if the target fuel mixtures are achieved at 3,750 rpm, then there is no need for a change to the tune-up so we leave it alone. But if the mixtures are showing that they need an adjustment, we would assume the engine’s torque curve isn’t linear and we’ll need to make a change between 3,500 and 4,000 rpm. In this way, we can determine for each engine what level of table resolution is actually required and make the tuning job easier and quicker than if we started out with a 24 x 24 table and needed to actually go to each cell to check them. Some engines may have very “peaky” torque curves and require a lot of fine table resolution, so the capability to add more sites may be beneficial, while another engine may have a variable cam setup that keeps the torque very flat and need almost no resolution at all. 2) When switching to a low-tension ring pack on a high-end naturally-aspirated engine, is there anything special that needs to be done with the cylinder? Do you need to change the crosshatch pattern or depth at all? 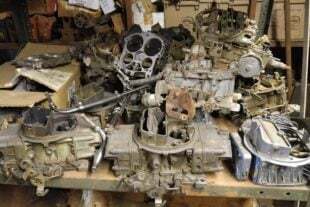 What about piston to wall clearance? Obviously, the bores need to be very straight and round, and the rings should be “light-tight” in the bores, meaning that you cannot see any visible gaps between the ring and the circumference of the bore when you shine a flashlight in there. 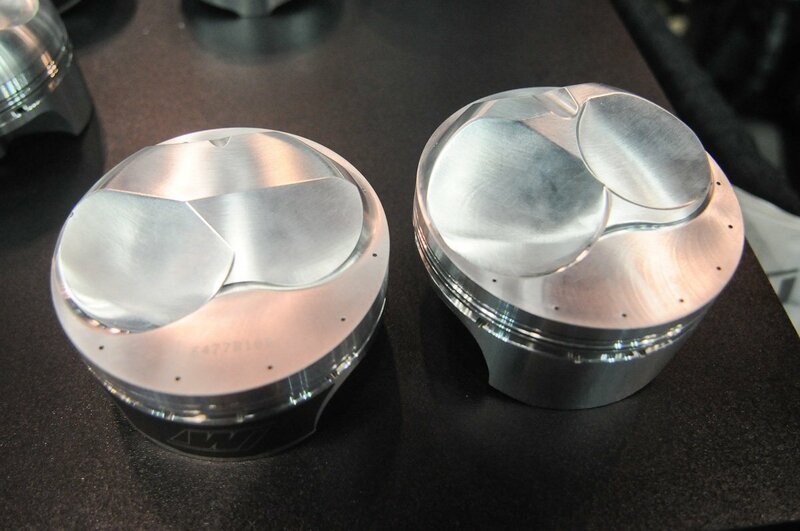 This is part of the reason many high-end engine builders have been gravitating towards higher stone counts on their honing machines. For example, many older machines have only two stones and two stabilizer shoes. When exerting pressure in only two directions in the bore its very difficult to keep the bore from distorting and becoming out of round. More modern machines have four or even six stones in them to help with this, and I’ve even seen some Pro Stock engine shops now using up to twelve stones for the ultimate bore geometry on their CNC block hones. Our Rottler CNC machine here at EFI University uses six diamond-faced stones and produces amazingly straight and round bores. Adding more stones is quite an expensive upgrade with diminishing returns of increased quality so we chose to stop there. It was already about an $8,000 upgrade from a four-stone system and would be an additional $18,000 to get to the twelve stone system! Some shops can justify that expense, but for most, a four-stone system will produce very acceptable results. 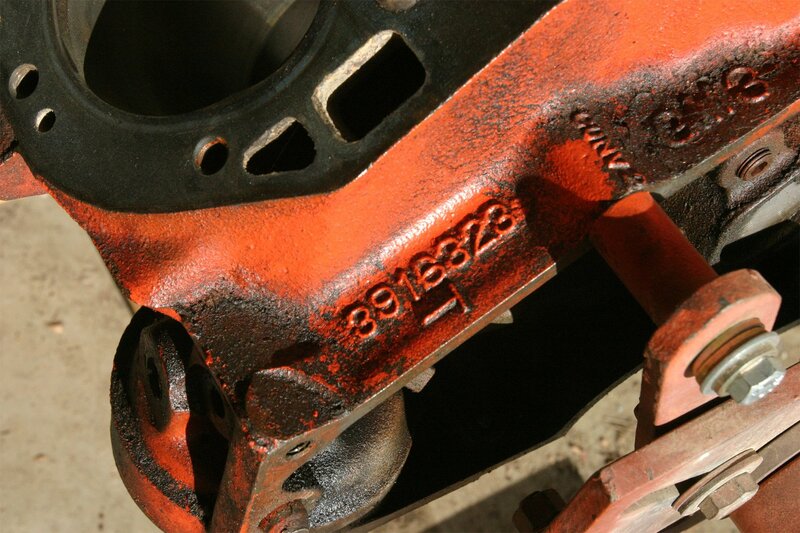 Now, once we have the bores straight and round, we need to examine the surface profile and cross-hatch angles. Without getting into a half-day long discussion, let’s keep it simple and just point out that the reason for monitoring and modifying the surface profile is to control the amount of oil retention on the cylinder wall. We need a certain amount of oil to lubricate the piston and rings, but we don’t want more than what is required. Typically, the larger the ring package or the higher the loads will be, the more oil will be required and vice versa. Also, the type and quantity of fuel will affect oil volumes and viscosities needed to maintain good protection. So, as we measure and track the surface profiles and cross hatch angles, we can tailor a profile for each package by altering the stone roughness, or “grit”, the stone speed, and the pressures we apply to the cylinder. We need to be able to carefully control and measure the effect of these items because each type of block will require something different to achieve what we want. 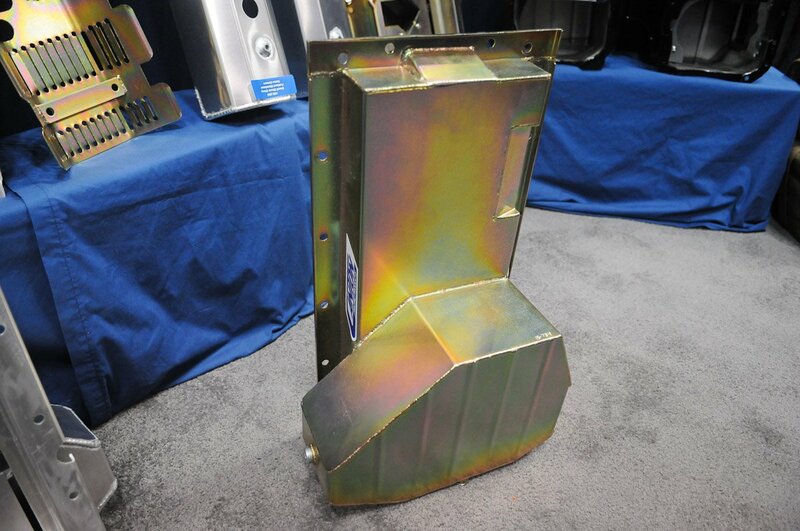 As the material gets harder, for example, we will need more stone pressure to get what we want, but if we use that same pressure on a softer block such as aluminum with an iron sleeve, we will get a vastly different profile due to the lower strength materials. We keep a base program for each of the block types we use and begin the honing process from there and measure the surface profile along the way with a tool called a profilometer so that we can adjust as necessary. Even blocks from the same manufacturer that came from different batches can behave differently, so we keep an eye on the entire process. As for the piston to bore clearance, the amount needed will depend much more on the piston materials and expected cylinder pressures than what ring pack is chosen. For example, due to its lower silicon content, a forged 2618 piston will be stronger than a 309 alloyed hypereutectic piston, but it will lack the thermal stability that a cast piston has, so it will require more room between the piston and the bore to prevent it from galling. Same goes for engines that will see higher pressures and temperatures that will cause greater expansion. 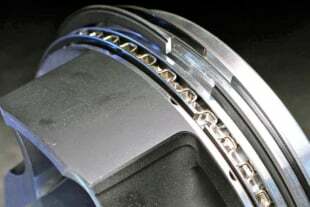 3) How much of a factor does a narrowed width main bearing play in freeing up horsepower? Are there any downsides, longevity wise, if I were to run them in a “street” engine? Maybe 1,000 cruising miles per year, with several trips to “Mexico”. Ben Strader: Great question Paul! The truth is, narrowing a main or rod bearing actually gives very little return on investment for any street-driven engine. Procedures like this are typically done when a builder is searching for every last ounce of power and only really show a significant difference in engines that regularly see very high RPM action. As the engine speed goes up, the amount of drag increases exponentially so these small modifications begin to add up. However, the gains come at the expense of bearing load carrying capacity and life expectancy, so they are typically only seen in short duration engines such as drag racing setups. When building these high RPM engines, I typically try to limit the drag and friction by reducing the bearing diameter first, since this directly correlates to lower bearing surface speed which gives a bigger return than narrowing. For example, a typical Chevy LS engine uses a rod bearing that is 2.100-inch in diameter, and about .790-inch wide. Narrowing it to .705-inch nets a reduction in surface area of 0.562 square inches, or about 10-percent total surface area. We typically have our LS crankshafts ground to a “Honda journal” size, which is only 1.888-inch in diameter, yet it is still .790-inch wide. We will often narrow this bearing down to around .705-inch wide, but as you can see, that is still only about a 10-percent reduction in width, which produces about the same one-half square-inch less bearing area, however the smaller diameter amounts to a significant difference in total circumference of 0.666 inches per crank revolution. At 10,500 rpm, this is a savings of about 583 feet per minute of bearing surface speed, and that is definitely a worthwhile endeavor! For extreme RPM applications we can reduce bearing diameter even further by using a rod bearing that is 1.850-inch diameter and 0.770-inch wide; in certain applications we have bearings that are even smaller. But again, all this very slight increase in performance comes at a large price in the form of extra cost and lower life expectancy, so for anyone using engines that live under about 8,000 rpm, I would consider these to be very low priority upgrades. For engines that will see severe duty and very high cylinder pressures, we will typically avoid the smaller bearings altogether and opt for standard or even larger bearing sizes to increase the overlap on the crank throws between the rod and main journals and increase the overall strength of the crankshaft at the expense of extra drag from bearing area. 4) I have a 1957 Chevy 235 six cylinder with an upgrade to headers and intake with 2bbl carb from Clifford Performance. I was wondering if anyone makes a EFI system for a 2bbl carb. I want the stability of EFI without the carb problems that come with a car setting for periods of time. Ben Strader: Hi Raymond, I always love to hear from people with classic cars who want to modernize them and take advantage of the new technology to eliminate hassles, and keep the same look and feel they originally had, and in your case, you’re in luck! The good folks over at Holley Performance Products had just such an application in mind when they came out with their new Holley Sniper 2300 EFI kit! The hardware very closely resembles an older Holley 2300 Two-Barrel carburetor and fits directly in its place. According to Holley’s website the part number for their self-tuning kit is 550-849. You should be able to install a kit like this in less than a day, using ordinary tools in your garage and then you’ll be off cruising around and enjoying the benefits of EFI almost immediately as the system tunes itself while you drive! 5) I’ve always heard that “carbs will make more peak power over EFI”. Is that just something old-timers say to resist EFI, or is there some truth to that? If there is truth to it, why? Ben Strader: Hey John, most of the tests we’ve seen trying to test between EFI and carbs haven’t been a real “apples to apples” comparison and frankly, I think its difficult to even try to do so. The main reason carbs typically win in tests like these is because of the cooling effect the fuel droplets produce on their way from the carb on top of the intake down to the combustion chamber. Because the EFI manifolds typically place the injectors very close to the inlet valve, they lose the extra time available to produce this same cooling effect, so the peak power numbers are typically lower. On top of that, they produce very worthwhile gains in low and mid-range power due to having less mixture scatter all around the inlet system and better cylinder to cylinder distribution, so they usually come out ahead in contests of average power across a range of RPM. 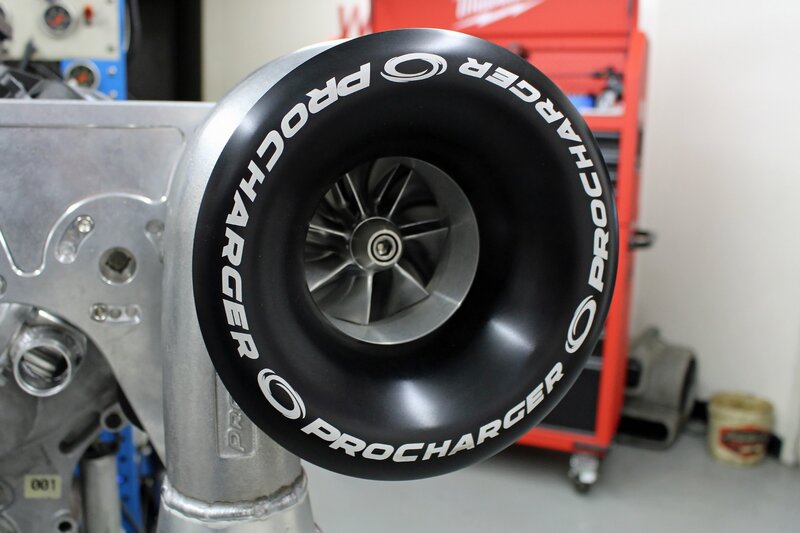 When NHRA mandated that Pro Stock teams would have to switch to EFI in 2016, many teams initially struggled with the massive power losses they experienced compared to their previous carb setups, but they quickly learned to adapt and overcome those challenges, and now most racers would tell you their cars actually seem to accelerate better from the moment they let the clutch out at around 6,500 rpm until they reach nearly 10,000 rpm, so they are seeing the same or better 60-foot and 330-foot times than when they had their previous carbureted setups! In our own testing and engine development program, we have tried setups using injectors mounted low in the rails as would traditionally be seen and also way up at the top inside the throttle bodies, just like a carburetor. In testing the same engine, on the same day, back-to-back, we saw a 40°F higher inlet temp on the low-mounted injector setup, which accounted for a loss of 32 horsepower on an N/A engine that was making over 775 horsepower when the injectors were at the top! So, it isn’t necessarily the carbs that were making the extra power, as much as it was where the carbs were introducing the fuel when compared to a traditional EFI system with a dry manifold and a front-mounted throttle body. Just food for thought! 6) I have a Harley VRod with a turbo. There are a couple ECUs available that claim to be the “best” for this application. What questions should I be asking to make a decision? Is Alpha N the best format or what other options are there? How does boost reference relate to rpm vs throttle position vs AFR vs spark timing? Can you prioritize the variables, first for the unit then for the dyno tuning process? Ben Strader: Hi Doug, this is always a tough one, because everyone claims to be the “best”, and it’s difficult to build a concrete case for a single one. That said, some things to look for would include the ability to make your tuning changes live instead of having to stop, and shut down before reprogramming and trying again. This will not only be faster, but will produce better results by eliminating variables in temperatures and pressures that can occur as time passes between tests. I’d also look for systems that have easy to use software for the user and perhaps even the ability to log and review data from tests. Alpha-N is typically a method that is used for naturally aspirated engines, as it relies only on RPM and throttle angle to determine engine load without reference to any boost or vacuum; this can create challenges during periods of boost to determine the exact fuel and spark required. In a case of a turbocharged engine like yours, you’ll find a “speed density” based system that uses a MAP sensor to be a much easier setup for tuning. Typically a tuning job is performed to give the engine enough fuel to make good power, and then add enough to deal with the adverse effects of extra heat from that power, while optimizing spark timing is done purely to improve combustion and power output so it makes good sense to tune the ECU tables that pertain to fueling before moving on to the spark tables on your dyno. Use only enough spark advance to produce good power without knock and let the dyno tell you what the engine likes. Refrain from chasing a number that you want to see if the engine is telling you it isn’t happy and let the dyno numbers guide you to the right choice. It may also be helpful to use an aftermarket knock sensor to help avoid using more spark advance than necessary and avoid potential damage to the engine. 7) Having followed along with the Spinal Tap project on Facebook, I see you guys have achieved valvetrain stability over 11k rpm. What are the other weak links you see playing a part in actually getting a complete, LS running engine to spin that high, and actually make power? Ben Strader: Hi Wayne, there are an enormous number of variables that go into reaching these astronomical engine speeds and absolutely nothing can go overlooked. We pay special attention to every aspect of the short block preparation from choosing the stroke and rod lengths to suit our desired piston speeds. The ring pack is specifically chosen to reduce drag and friction and that requires a detailed look at the cylinder wall texture and finish to make these tiny rings work well. We even choose our oils based on the chosen materials and intended application, and the oil we choose affects our approach to windage, oil drain back and desired oil pressures. Of course, getting the valve train to be safe at these RPM levels was an overwhelming challenge, but the difficulty in getting the cylinder head ports, piston speed, cam timing, intake runner volume, length and plenum volume all correct as well should not be underestimated. It takes a lot of math, a healthy dose of experience and a willingness to try different things during the testing and development stage to get it just right. In our classes we try to teach the idea that the engine is a “series of dependent events” and that each choice you make has consequences that must be understood and accepted in order to make the other engine components work properly. What works in one application may be totally wrong for another one and we try to teach our students how to identity these variables and address them in the design and development of racing engines. ed. note: We have an in-depth series on the Spinal Tap engine program coming right here to EngineLabs; Jeff Smith recently spent a few days at EFIU gathering the details. I really enjoy your articles and have been following all your articles and question “For theoretical calculations such as this we assume 100-percent volumetric efficiency.” What part of the formula is the denominator for 100-percent and can you have over 100-percent without an additive? Following the information on the Maskin engine I realize the dyno numbers are corrected, but this looks like it exceeds the 100-percent factor. I put all the information from your article about an air pump into a Excel sheet that works great, but as you know most engines make more HP then the air pump allows, just ask them. Ben Strader: Hi Jim, good observation about the VE numbers! The truth is, many high-output racing engines can easily achieve 100-percent volumetric efficiency, and a great number of truly well developed engines can far exceed that number. Some of the best N/A engines in the world actually realize 115- to 120-percent and more VE numbers over a relatively narrow range of engine speeds. This is all the result of highly sophisticated testing and development and while entirely possible, I just don’t feel that the average guy out there is willing or able to put forth the money and effort to do it. This could partially explain why there are so few championship-winning teams out there. For that reason, I find it easier to assume the vast majority of high performance engines will never realize their full potential and see 100-percent VE while also maintaining any semblance of low speed drivability, fuel economy or exhaust emissions as may be required for road going vehicles. Thus, when teaching our courses it is more relevant to use 100-percent VE as a common value, so that when students begin to apply the math we present they arrive at more realistic numbers than if everyone assumed the engine they built was ready for NASCAR or Pro Stock competition. That isn’t to suggest we won’t see guys who can get there, but rather we have geared our material towards the 99-percent rather than the 1-percent of outliers who may need to alter their math equations to make them resemble the engines they work on. 9) When wiring a car, how important, if at all, is using shielded cable? I have several electric pressure sensors (0-100 psi; oil and fuel) I need to extend the wiring on, and they use shielded cable from the factory. Can I safely extend the three conductors in the cable with regular insulation, but without shielding? Also, is there a DIY shielding, or do I need to buy 3-conductor shielded cable? Ben Strader: Hi Gary, using shielded cable can be very important for certain circuits and not that critical for others. Typically when a circuit is going to be sampled at a very high frequency, such as a crank position or drive by wire throttle position, we want to make sure that none of the samples can be overlapped or interfered with by noise in the vehicle, so those circuits tend to be protected with extra care and usually will have some shielding. Other circuits such as slower responding engine sensors that carry information that doesn’t change quickly don’t need as much protection. An example might be the water temperature. Since the water temperatures physically cannot change very rapidly, there isn’t a need to sample the sensor 100 times per second, so the likelihood of fast moving transient noise “spikes” messing things up is lower. Also, it should be noted that most ECU systems use two separate ground planes. One to ground the ECU itself to the same plane as the vehicle chassis and battery, and another called “sensor ground” which is only used to monitor the voltage on the circuits that carry sensor information. This ground is usually referenced to the chassis ground as well, to compare the level of external “noise” on the system and automatically correct the sensor values for this. By using this method the ECU manufacturers can ensure good system control over a wide range of outside influences such as high power stereo systems, CB radios and more powerful alternators that may be installed in the vehicles. Having said all that, it never harms anything to add extra shielding or protect the wire connections you are making in a harness. For the circuits you mentioned I would say the shields are not required, but making good solid connections is a must, and protecting the wire and connections from the elements is paramount. We offer a high-level Motorsports Wiring and Configuration course for those wanting to take things to the next level of professional automotive wiring that provide all kinds of examples for proper connections, shielding, covering methods and materials and even the how’s and why’s of concentric wire twisting. Each student gets to assemble and build their own small motorsports grade wiring harness and take it home with them after the class to have on display for friends, family and potential customers to see.